Intergenerational economic mobility refers to the extent to which economic status is perpetuated across generations (Black and Devereux 2011, Jäntti and Jenkins 2015), and has become an increasingly important political concern. Much of this interest is motivated by the worry that growing disparities in income and wealth are reducing the chances for disadvantaged children to rise through the income ranks (Piketty 2014). Country comparisons generally support this view – persistence in income from one generation to the next is higher in unequal societies like the UK and the US, and weakest in the relatively equal Scandinavian countries (Corak 2013). This inverse relationship between income inequality and intergenerational mobility has become known as the ‘Great Gatsby curve’ (see Figure 1). Notes: Left panel displays income inequality (measured as the Gini coefficient of family income ∼1985) and intergenerational persistence of income (father-to-son elasticity in long-run earnings for cohorts born in ∼1960) across European countries based on data from Corak (2013). Right panel displays income inequality (measured as the Gini coefficient in family income of parents minus the top 1% share) and intergenerational persistence (the family income rank correlation for daughters and sons born in the early 1980s) based on data from Chetty et al. (2014) for ‘synthetic’ European countries in the US. Synthetic country estimates are US-wide averages with weights assigned based on local representation of each ancestral group, as described in Berger and Engzell (2019). While country differences are striking, a recent body of work also documents that similar divides characterise areas within the US. In an acclaimed study, Raj Chetty and colleagues found that the extent to which parents’ income levels determine that of their children varies almost as much within the US as it does between countries (Chetty et al. 2014). Proposed explanations for this regional variation have included factors such as family structure, inequality, social capital, and investments in K-12 schooling. Yet, the historical origins of these divides remain largely unknown. What are the origins of the American ‘land of opportunity’? To understand differences in inequality and income mobility in the present-day US, we need to consider the immigration flows that profoundly shaped America more than a century ago. During the Age of Mass Migration (c. 1850-1914), more than 30 million Europeans crossed the Atlantic in search of opportunity. European immigrant groups often settled in regional enclaves, which largely have persisted over time. Today, when Americans are asked to identify their ancestry, what emerges is virtually a map of immigrant settlement patterns from more than a century ago. Scandinavian and German ancestry, for example, is overrepresented in the Midwest, while Americans with French and Italian ancestry are mainly found in the northeast of the country (see Figure 2). Notes: Maps display the share of the population that report each European ancestry in the 1980 US Census, upward mobility (the percentile in the national income distribution that a child born to parents at the 25th percentile can expect to attain in adulthood), intergenerational income rank correlation (persistence of family income), and the Gini coefficient of income (minus the top 1%) from Chetty et al. (2014). Do these places where descendants of European immigrants live show systematic similarities to the countries their ancestors came from? In a recent paper (Berger and Engzell 2019), we show that this is indeed the case. For example, equality and mobility are highest in the Midwest, where Scandinavian ancestry is common. The same goes for every group we study – for example, income mobility is lowest in areas where the population has Italian or British roots. We use the regional concentration of ancestral groups to create ‘synthetic’ European countries (aggregates of places within the US with a heavy overrepresentation of a given group). Comparing these synthetic countries to their European counterparts reveals a virtually identical gradient in inequality and intergenerational mobility. 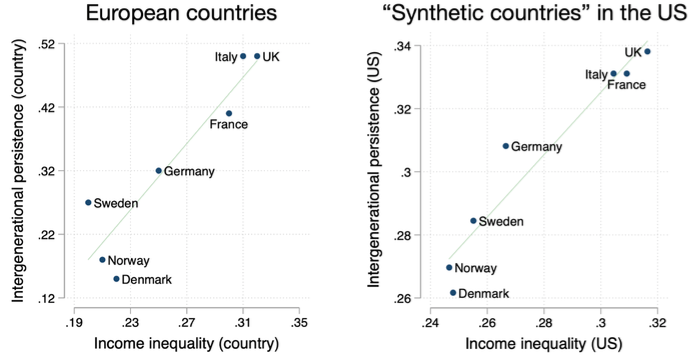 Hence, the Great Gatsby curve also emerges when one compares levels of income inequality and intergenerational mobility across these synthetic European countries (see Figure 1). Is it about people or places? Can these differences be taken as evidence for differences in income mobility between communities within the US rather than, for example, Scandinavian Americans being more upwardly mobile than their fellow countrymen? The answer is arguably yes, because the black population shows similar patterns of income mobility in these areas. Further support for this interpretation is found when we study outcomes for children that received different exposure to, for example, places with British and Scandinavian ancestry during their childhood, due to family moves. In other words, it seems that European immigrant groups have made their imprint on communities, which shape opportunities for the local population more broadly. America is unique in that 19th century immigrants broke new ground along the frontier in areas that largely lacked modern institutions. Historians testify to how poor-relief, schools, or healthcare were organised locally around religious communities or other civil associations. Even today, we find a number of differences in such local institutions. For example, the more mobile areas in the Midwest have expanded the Earned Income Tax Credit to a greater degree than the rest of the country. Taxation is also more progressive and there is better access to college education. Thus, in several dimensions, areas in the US where Scandinavian descendants live resemble a ‘Scandinavia in miniature’. A growing literature finds that the persistence of economic status is strongest in unequal societies such as Britain or Italy, and weaker in countries like the Scandinavian welfare states. While the US ranks among the least equal and mobile countries in the developed world, recent work shows that it contains places that span the global mobility distribution. In this column, we linked these two observations by studying the microcosm of Europe that arose as millions of immigrants crossed the Atlantic and settled over a century ago. Our results speak to the long-run impact that European immigrants had on their communities (Sequeira et al. 2019) and, conversely, to the historical roots of cross-country differences in inequality as we know them today. Indeed, existing literature documents how cultural beliefs and preferences are transmitted from parents to children and can persist over multiple immigrant generations (Rice and Feldman 1997, Algan and Cahuc 2010, Luttmer and Singhal 2011). While such cultural transmission is well established, we provide new evidence of how different conceptions about the organisation of society can persistently shape places, policies, and opportunity in the long run.